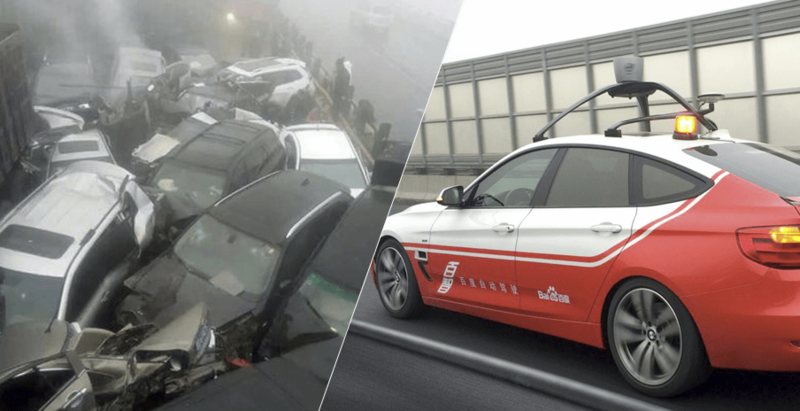 This week we heard the horrific news of a 33-car crash in Tianjin, China which killed 6 people and injured dozens. This wreck is being largely attributed to the intense smog conditions that are of a level that for the first time triggered a ‘red alert’ by authorities, the most critical on their polition scale. With the China’s smog problem likely to take years if not decades to resolve, China needs a long term solution to ensure this never happens again. The Mirror, UK says most of the pollution is being blamed on coal-fired power stations and vehicle emissions. When polution is so bad that its risking your health by being outside and risking your life by driving down a road you can’t see the brake lights ahead of you, there’s a serious problem that needs a serious fix, and fast. One possible solution is for autonomous vehicles to take care of the driving instead of humans. These vehicles have the potential to not only decrease, but elliminate crashes like this entirely. With a combination of cameras and sensors, radar and even sonar, technology allows the car to build a 3D picture of the environment around it and the critical element is this works a night, or with no light. Today we discovered the China-based Baidu (also a search company like Google) is working on autonomous vehicles with BMW. We seen BMW show off their i3 driverless tech under very controlled tests at CES in January this year. Recently the Baidu completed a 30km trip without intervention from a human. The modified BMW 3 series car, successfully navigated its way though a mixed range of conditions, importantly not just highway driving. This is reportedly the first mixed-road condition test of an autonomous vehicle in Asia, a major milestone and something that definitely shows the race is well and truly on. While China may have very different motivations to solve the driverless vehicle problems, ultimately with more international competition, consumers will see vehicles earlier than expected. In the case of the massive accident above, this will ultimately save lives. Right now cars provide freedom, but imagine a world where we enter our car in our garage and get out at work with the filters in the car clean the air consumed inside the vehicle, while the computers inside it get to you destination safely. In relation to reducing the pollution from vehicles, this will take time, but as the electrification of vehicles continues and prices drop, its likely to happen faster that you first expect. If China can promote EV as not just an option, but a decision to help the country and its people survive, while providing EV incentives, the transition away from fossil fuels could be expedited.